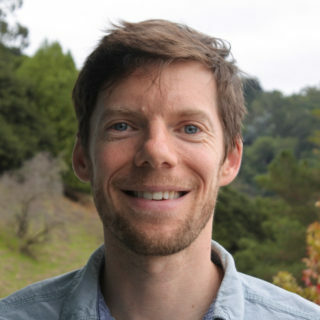 Trevor F. Keenan is a Scientist in the Climate and Ecosystem Sciences Division at Lawrence Berkeley National Laboratory, and an Assistant Professor at the Department of Environmental Science, Policy and Management, UC Berkeley. Prof. Keenan’s interests are centered on understanding the impacts of climate variability and long-term change on terrestrial ecosystem function and land surface dynamics, as well as related feedbacks to the atmosphere through ecosystem carbon cycling and water use. His work combines large ecological data sets (e.g., eddy-covariance, remote sensing), models of ecosystem state and function, and data assimilation/mining tools, with results from in-situ field studies and experiments, to gain a mechanistic understanding of key physical and biological processes. Prof. Keenan uses methods from diverse disciplines, including ecophysiology and biogeochemistry, micrometeorology, atmospheric science, mathematics, statistics and high-performance computing. As an Ecosystem Scientist, my work spans from individual organisms (primarily phototrophs) to ecosystems, landscapes and the globe. My interests are centered on understanding the terrestrial carbon cycle by examining the impacts of climate variability and long-term change on terrestrial ecosystem function and land surface dynamics. My work combines large ecological data sets (e.g., eddy-covariance, remote sensing), models of ecosystem state and function, and data assimilation/mining tools, with results from in-situ field studies and experiments, to gain a mechanistic understanding of key physical and biological processes. I enjoy using methods from diverse disciplines, including ecophysiology and biogeochemistry, micrometeorology, atmospheric science, mathematics, statistics and high-performance computing, and collaborating across fields to do so. I enjoy communicating my results to a wide audience, and find interacting with journalists a great way to translate science results to the general public. Below are some of the outlets in which my work has been covered in the past. 2016: Covered in over 75 news outlets worldwide, including the Economist, The Guardian, The Washington Post, El Pais, BBC News, New Scientist, ABC News (radio interview) and Public Radio International (radio interview), and science blogs such as The Carbon Brief and Future Earth. 2015: Covered in Scientific American, ABC News, The Conversation, New Scientist, The Weather Network and Earth Gauge. 2014: Covered in 12 news outlets including ABC radio, Science Daily, AccuWeather and Nature World News. 2013: Covered in 24 international news outlets, including The New York Times, TIME Magazine, New Scientist, along with national press such as the Australian Tribune, and prominent science blogs such as The Carbon Brief.